Golden Ensembles 3 provides you an exclusive collection of 44 cutting-edge ensembles for NI Reaktor-5. Synthesizers, effects, innovative and creative audio tools- everything is packed, with hundreds of presets ready to be used! Golden Ensembles 3 includes the two mega-synths Ebola and Cobra, Bass Lab, and many other impressive synthesizers and instruments. In addition, it contains classic processor emulations like Vintage Chorus and Crow Plate Reverb, and unique sound design tools such as Executer, White FX and Sound Pilot. 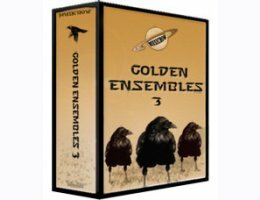 Whether you are a music producer, a soundtrack composer, a mixer, or a sound designer- Golden Ensembles 3 will add new beautiful and unique colors to your sound palette! Cobra - With its vast sound capabilities, unique sound sources, 16 filters types, countless interesting modulators, endless routing possibilities, 12 high quality effects and much more- Cobra will make any synth-freak fall in love! Ebola - Ebola is a powerful semi-modular virtual analog synthesizer with a flexible architecture, that enables you to create a wide variety of sounds with a distinct flavor! Orpheus II - Orpheus is a reaktor synth with a sound of its own. Orpheus will add unique new colors to your sound palette: Extreme leads, distorted guitars, powerful basses, dreamy pads, electric pianos, and fresh experimental sounds- with superb sound quality. Bass-Lab Bass Lab is your laboratory for electronic bass sounds! This powerful bass synthesizer was designed with one purpose in mind: to produce ultra-modern fat and punchy electronic basses that sounds amazing. Sound Pilot - Sound Pilot is a new breed of audio tool that produces synthesized effects. Amazing pumping bass lines, psychedelic rhythmic textures, futuristic drums and much more - Sound Pilot sounds like nothing you have heard before! DigiFreak - Digifreak takes the Lo-Fi sound to new extremes! This powerful synth combines digital wave-shaping, special sound degradation processes, granular synthesis techniques, and advanced Lo-Fi effects to produce crumble corrupted and disintegrated beautiful sounds, with an emphasized digital character. Piano Magic - Piano Magic combines the acoustic piano and the synthesizer within one reaktor instrument for the creation of beautiful sound textures that were never heard before! Theremin - Theremin is a reaktor ensemble that produces a very convincing analog theremin sound. Based on 10 different real Theremin samples and advanced synthesis techniques, Crow Theremin will turn your reaktor into an expressive and playable theremin instrument. Brass Machine - Brass Machine is a reaktor ensemble that produces convincing synthesized brass sounds or more electronic brass leads. Trancoid - If you produce trance, techno, electro, or any other kind of dance music- don't miss Trancoid! Future-Bass - Future-Bass offers a new approach for designing bass sounds. The combination of sampled bass guitar sounds and synthesized bass sounds in one reaktor ensemble, has surprising results! Crow Accordion - With Crow Accordion you can easily create any accordion sound you wish with your reaktor! Classic to weird accordions- everything is possible with this reaktor ensemble! Crow CX - Crow CX is a reaktor synthesizer, that is inspired by the classic vintage Yamaha CS series. Oberline - Oberline is synth line for NI reaktor that is inspired by the oberheim sem units from the early 70’s. If you are a fan of vintage synthesizers sound, Oberline was created for you! Blue Crow - Based on our new SLS synthesis method, Blue Crow is a unique synthesizer for reaktor that produces a wide range of soft and gentle sounds. Chaos - Chaos is a sound generator that produces synthesized chaotic beautiful textures. Chime bells, wind, streaming water, electronic drowns, and much more. Vinyl - Vinyl is a reaktor ensemble that brings DJ scratching directly to your studio, with the advantage of precise midi treatment for the exact results you need. Crow Plate Reverb - Crow Plate Reverb brings the classic old plate to your studio with superb sound quality. Analogica Filter - Analogica is a full of character analog filter emulation for Native Instruments Reaktor, with a warm crunchy sound. Crow Drive - Crow Drive is a multi-band distortion effect for NI reaktor. This unique sound design tool can add character or completely change any audio material you throw into it. Crow Tape Echo - Crow Tape Echo is a reaktor effect that was designed to recreate the warm vintage echo sound of old tape delay units. Vintage Chorus - Vintage chorus is a reaktor ensemble that emulates the way a well known vintage chorus hardware unit behaves and sounds. Vintage Chorus will be your ultimate solution when you look for sweet acoustic guitars, wider background vocals, or for the addition of spatial effect to a mono source. Executer - Executer was designed to make things sound “bad”, unnatural and edgy. When you feel like breaking something- you go to Executer! Red Snapper - Red Snapper is the effect for special missions. Combining digital and analog distortion with multi-notch filters and other goodies, Red Snapper will add its unpolished character to anything you throw into it! Osmosis Filter - Osmosis Filter is a fat warm resonant filter that is inspired by analog filters like Electrix Filter Factory and Sherman Filterbank. Green Master Tape - Green Master Tape emulates a 1/4'' tape machine. It will add the warmth and depth, and the typical side effects (Wow and Flutter, Hiss, Crosstalk and leakage) of analog tape recorders to your digital tracks. Crow Magician - Crow magician is a delay unit for special occasions. With a mono reverb unit and a filter within the feedback loop of each tap, a wild reaction can be initiated. It can produce amazing spacey sci-fi sounds, a successive wonderful rain of delays and other audio magic. Tube Compressor - Tube Compressor is a tube compressor emulator for NI reaktor. Non-standard Knee controls allow the articulation of the compression characteristics. Phase Lab - Phase Lab enables you to easily correct any phase issue between two tracks. It also gives you the opportunity to carefully shape your sounds only by changing the phase setting of one audio track, without using your EQ. Reverb Box- Reverb Box emulates popular reverb units from the 80's. With detailed diffusion, dense smooth tails and astonishing quality, Reverb Box is the ultimate solution when hi-end acoustic space emulation is needed. White FX - White FX is a special reaktor ensemble that takes granular synthesis to its limit to create wild fresh 21th century effects. Mood Filter - Mood Filter is an effect for NI reaktor that emulates a famous vintage analog filter. It can be used to obtain slow filter sweeps or more massive and distorted filtering effects, all with the famous ladder filter sound. GrainD lay - GainD lay is a unique granular delay effect for NI reaktor, that is able to create unusual surprising effects. Electroverb - Instead of creating the regular room reverb, Electroverb offers a distinctive unusual reverb sound: Long washes, pitched metallic drones, weird and wonderfully sci-fi reverbs- will inspire you and let you express your creativity. Ultra Chorus - With a very complex delay modulation based on a new technology, Ultra Chorus is a reaktor effect that offers you a top quality cohesive and sweet chorus sound. Crow Tape Flanger - Crow Tape Flanger provides you with a sweet warm and authentic tape flanging sound. Space-Boy - Space-Boy offers you a new revolutionary approach to space locating of audio signals. Crow Preamp - Crow Preamp is a reaktor ensemble that will add analog tube warmth to your digital tracks. Vocal Modeler - Vocal Modeler is a reaktor ensemble that can change completely the character of a human voice. Turn a single voice into a chorus, turn your female singer into a witch, make her whisper, change a low mail voice into a girly one, and make vocal effects that were never heard before! Ultra Phaser - Ultra Phaser has all the characteristics of analog phaser effects. It offers an amazingly rich, warm, silky sound without becoming nasal. Crow DX-3 - Crow DX-3 is an all-around delay effect with a classic analog character. Gold Delay - Gold Delay is an exiting reaktor delay-based effect, that can produce unusual sound effects. Crow Graphic Equalizer - Crow Graphic Equalizer is a mono/stereo 31-band graphic equalizer. Crow Tremolo - Crow Tremolo is a tremolo and auto-gate effect for NI reaktor that emulates the tremolo effect of classic guitar amps. ?